Friendly Territory and ACTIVATE! can release! 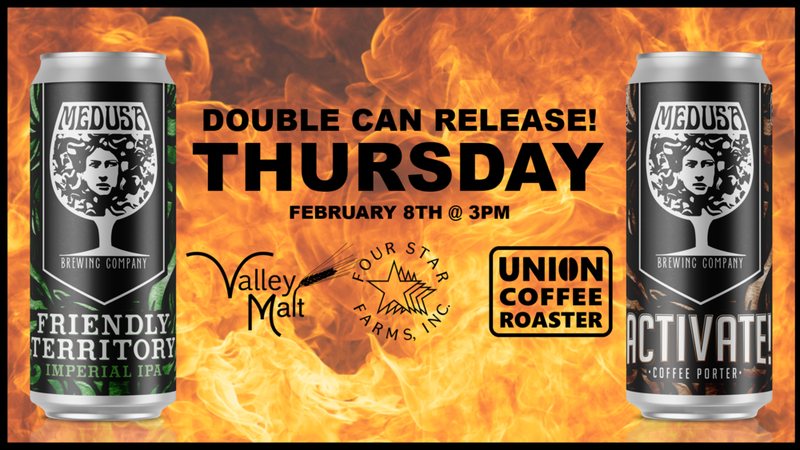 Stop by and grab a 4-pack, a pour, and say hello to Four Star Farms, Valley Malt, and the Union Coffee crew. We’ll be there too! Explore the brewing terroir of Massachusetts! Friendly Territory's pale, dry body is crafted entirely with 2-Row Barley and Warthog Wheat from Valley Malt (Hadley, MA) and features an array of hops from Four Star Farms (Northfield, MA): an alluring blend of Centennial, Crystal, Cascade, Magnum, Mt. Rainier, Pepite, and Chaos, resulting in lush aromas of tropical citrus with a crisp herbal background. ALSO AVAILABLE ON DRAFT AND IN CASK w/Grapefruit! With Activate! we've taken a robust porter and infused it with local coffee, masterfully roasted by Jesse Medley of Union Coffee Roasters. Our black ale's rich cocoa and subtle caramel notes provide a lovely base to freshly roasted Burundi, a bourbon varietal described as tart, juicy, with fruity characters of strawberry, blackberry, apricot, lemon, and grapefruit.